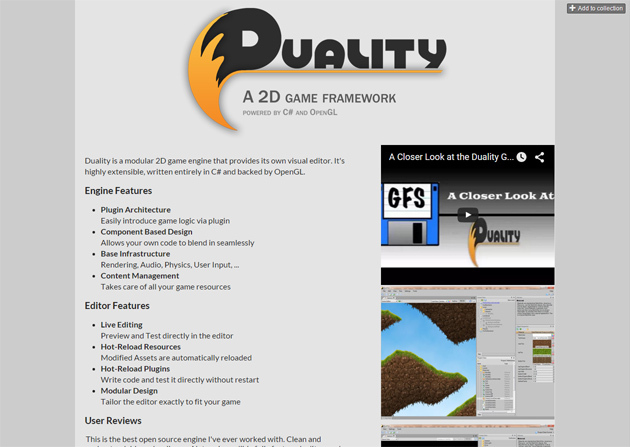 just a quick note that I've set up an itch.io page for Duality. If you don't know itch.io, it's basically an indie platform where everyone can put out the digital things they create and sell them on a Pay-What-You-Want basis - including projects that are completely free, like Duality. Let me know if there's anything to improve on the info page, or if you have other thoughts on this. Anything really. 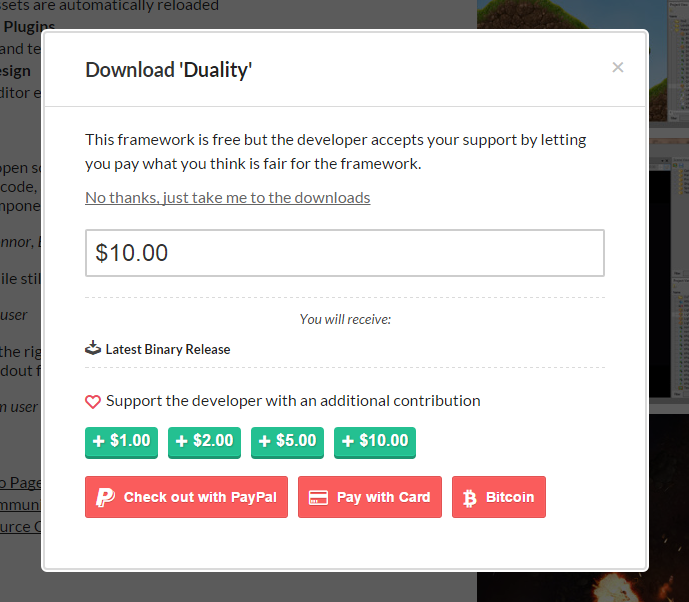 I was also thinking of putting an itch.io link besides the Paypal donation links on the official info page and GitHub repository later. It's basically a simple single-page design, not unlike the one of the Duality info page. Contains just a brief description of the project, some screenshots and a link to the new "A Closer Look At" video Serapth posted here a while ago, so everyone can get a good overview quickly. I have a question: I'm not sure how itch.io works, but do you need to manually upload the latest binaries, or is there a way to make a bot that automatically updates the file? I know that Duality downloads its packages from NuGet, but what happens when a mandatory update is released and you can't get it from NuGet? I was in fact wondering the same! Fortunately, itch.io also allows you to specify an arbitrary download link, so the itch.io page can basically link to the same download the official info page does. That way, I can keep it all in one place without any more changes necessary. I have an idea: why not use the Duality launcher and editor icon as the page favicon (if that is possible)? I think it would look much better.